Our customer was looking for a quality product at an affordable price. Building at site was too costly and messy. They chose Little Buildings for their solution with a quality totally pre assembled guard house built of tough, welded galvanized steel! With over 16 years of design and manufacturing experience, you know you can trust a guard house from Little Buildings, Inc.
Our customer was looking for a quality product at an affordable price. Building at site was too costly and messy. They chose Little Buildings for their solution with a quality totally preassembled guard house built of tough, welded galvanized steel! With over 16 years of design and manufacturing experience, you know you can trust a guard house from Little Buildings, Inc. Built for the main entrance to a major pharmaceutical company this guard house serves as a checkpoint at a visitor entrance. 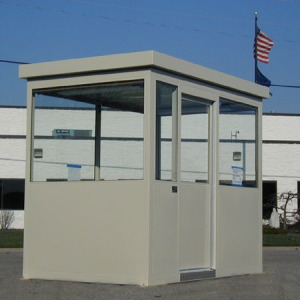 Features on this standard guard house include work counter with storage drawer, sliding door with maximum security lock, 3" canopy overhang, tempered safety glass windows, galvanized steel treadplate floor, paint in color of choice, insulated walls and ceiling, built in gutter system, sloped roof, and one year warranty on parts and materials. Options available are almost unlimited and include anti-fatigue mat floors, intercom systems, additional countertops and cabinetry, insulation under floor, energy star air conditioning and roll-down galvanized steel security shutters. What do you need to harden your entrance? We offer bullet-resisting units too. Give us a call or send an email and let us know! Don't be fooled by imitation low quality competitors. Confidently select Guard houses from Little Buildings, we are the experts!